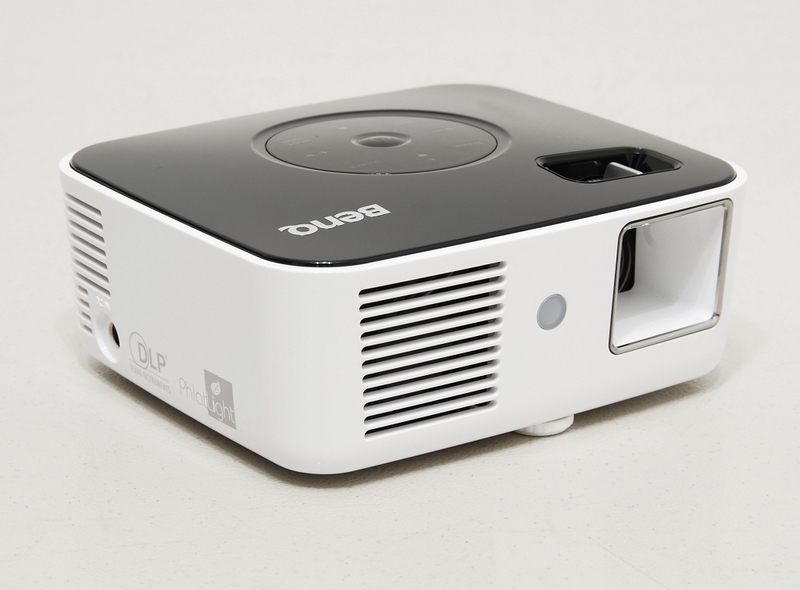 The Joybee GP1 Mini Projector is BenQ’s most compact and portable projector, boasting image sizes up to 80” and featuring a rather unique USB reader that allows you to run media without the assistance of a computer or additional video input device. When BenQ approached us to review the Joybee GP1 projector we stopped to think about it for a second considering it deviates from our usual coverage of computer peripherals. That said, the idea of testing the minimalistic projector sounded appealing from the perspective of a gadget lover that wouldn't mind dumping a large monitor for a 60-plus inch projected screen under the right circumstances. Furthermore, this is just the beginning of a developing trend of 'pico' or 'palmtop' projectors that offer form factor convenience, along with the use of LED-based light sources. LED projectors do away with common nags associated with traditional projectors like the use lamps that need to be replaced during its lifetime. Inside the GP1 box we find the projector tucked away in a black carrying pouch, AC adapter, remote control, a 2GB USB flash drive, quick start guide, safety manual, user manual on CD and a multiple input cable. While this is the final version of the projector, BenQ told us that the commercial bundle will include software to convert all video files to a format that is compatible with the projector. The multi-input cable provides connectivity for composite and VGA inputs. The user manual indicates the best video connection method is component video, although no component cables are supplied. Upon further investigation we discovered that BenQ suggests using a component video to VGA adapter (not provided) in order to use such source. The included remote control, although very plain in design, allows you to manipulate most aspects of the projector without having to physically interact with the unit. BenQ also includes a 2 GB flash drive for storing videos or presentations that can be run directly from the projector without the need for a computer interface. Although not the smallest projector on the market, the GP1 can still easily be classified as a mini projector. The unit measures 5.35 x 2.12 x 4.72 inches (smaller than a Mac Mini) and weighs only 1.4 pounds. The Joybee is white with a black top. The front of the projector features a vented exhaust slot on the left, followed by the IR remote sensor in the middle and the projection lens on the right. The remote control must be held at an angle within 30 degrees perpendicular to the projector’s IR remote sensor to function correctly. As with other standard projectors on the bottom we find a height adjustable foot and a standard tripod socket in the center should you not have a table or other flat surface to place the projector on. The focus ring and external control panel are found on the top of the unit, the latter being touch sensitive. The buttons on the control panel are labeled and light up blue when in use.